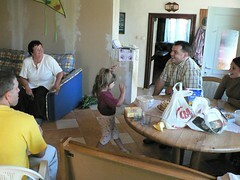 Above: On Thursday, we were thankful for the opportunity to visit an orphanage in the neighboring town of Selyp. These kids have been moved around more than once because of their behavior. We hope to bless them with love, and with the message of hope in Jesus Christ. Our desire is to visit these kids at-least once a month and to connect them to some of the teens in our church. 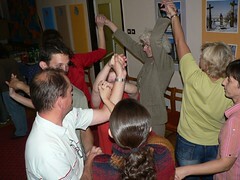 We started the evening with singing, and afterwards Miki performed an 'ice breaker' pantomime. The kids loved it. 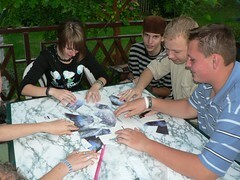 Above: After breaking up into two groups (girls and guys in separate rooms), we had a time of discussion and games together. At one point in our discussion with the boys, I asked is there any purpose in life. Every one of them answered, "no". They added, "I should just hang myself or jump in front of a train." These are kids who have suffered rejection upon rejection and are in need of a miraculous change of heart. This can only occur as they see the love of Jesus and receive the free offer of a new life. Afterwards, Gabi said, "You know Allen, we need to go back. We need to keep building friendships with these kids." Praise God for teaching us to love as He loves. This ministry has also already served to break down some culturally carried discrimination against Gypsies. Gabi told me that he had hesitation initially when walking into the room with mostly Gypsy teens. But as he listened to them, and as we began playing games together, he said that there was a sudden change of heart. He said, "I now understand their need, and the tough background that they have had." Above: Kira 'checked out' at the doctor. All is well, and her height is nearly off the charts. She is a strong baby, and already holding her own weight (and its alot) at 4 months. 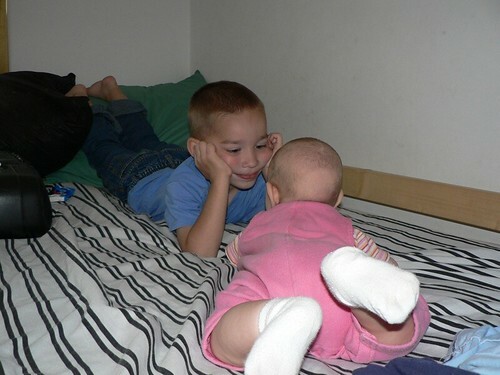 Just the other day, Sharon discovered the hint of Kira's first tooth making its way up. 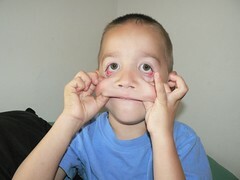 It's comical that Ben also has a tooth in the same place in his mouth that is coming in at the same time. 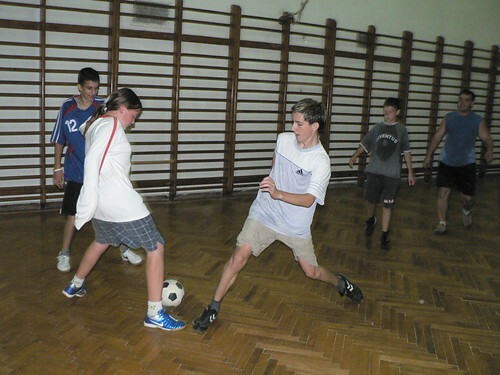 Above: Friday night, we moved our sports outreach indoors as the weather continues to get cooler. At break-time, I encouraged the teens to be those who seek God's kingdom first in life as this leads to a life of blessing. Bence (above L) is new to our sport outreach. 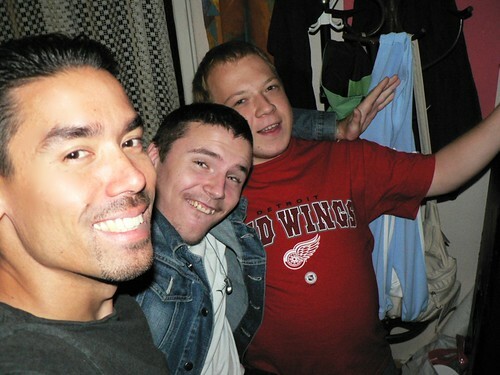 Oliver (above R) has known us for some time and even attended bible classes with Miki 3 years ago. 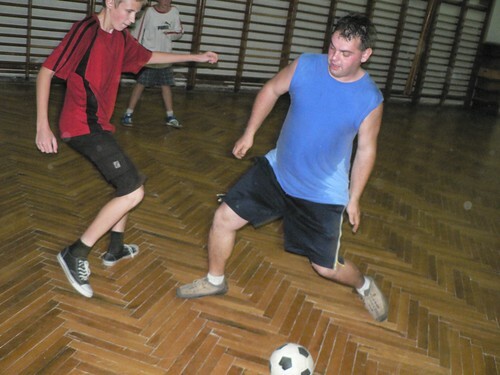 When the teenage years came, Oliver 'dropped out', but still attends our sports outreach. We are thankful to have a voice of encouragement and direction in his life through this ministry. Above L to R: Gabi K., Zoli, and Milán. I was happy to see Milán, who was once an active attender of our church, but disappeared for a time. We hope that he will be able to come again this Sunday (please pray for him!). 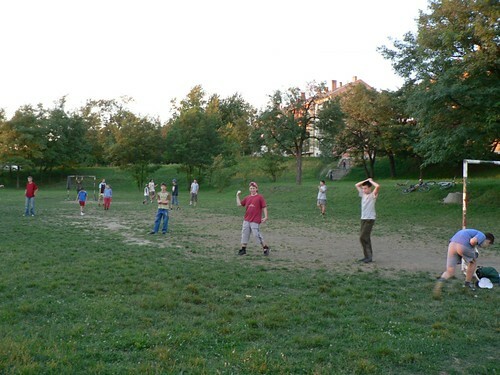 After our sports outreach, Csaba, Miki, Zoli, Gabi K., and myself spent some time outside in prayer. Zoli shared his struggle with anger at the other kids who were cheating. We talked about our need to be forgiving people, and our need to control our anger. I am thankful for Zoli's growth and his quickness to turn away from what he knows to be destructive to his relationship with Jesus. Above: Gabi K. and Miki slipping and sliding toward the ball. We have known Gabi K. since coming to PetÅ‘fibánya. Gabi put his faith in Jesus some time ago, but his parents do not allow him to attend church. 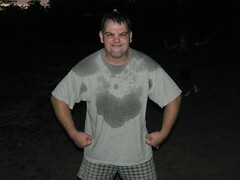 He may be able to attend our thursday night Bible study with the teens, so please pray for him! I would love to see his faith flourish as we meet together. Above: Tonight, we held our registration and orientation for a new semester of ESL in PetÅ‘fibánya. We have 19 students, with almost half being completely new to our program. 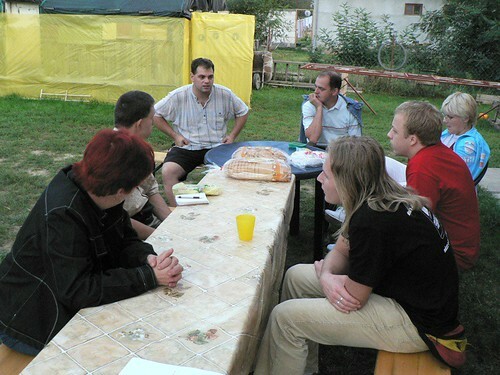 Viktor (above left) was one of my first students three years ago in PetÅ‘fibánya. He dropped out of the program a year ago, but has now returned. I am thankful for a new opportunity to re-connect with him. 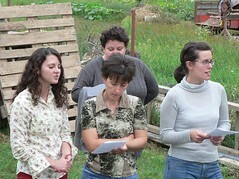 Above: Sisters Monika and Erzsi from the nearby town of Jóbágyi joining our program for the first time. Bible study, however there is a yoga class on the same night that she attends (hmmmm-coincidence?) We were thankful that she will be able to hear God's word in this ESL program in the second hour. Please pray that she may find out the truth about Jesus and the gospel through this study. Above R: Feri is also a first time student in our program. It turns out that DezsÅ‘ knew Feri from childhood. 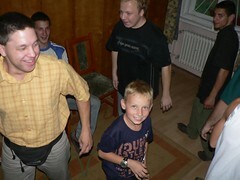 We found out tonight that Feri lives in PetÅ‘fibánya, was saved in 89 but doesn't attend church. It seemed like he had a good time and we hope to see him this Sunday (please pray for him). Above: After registration, Brenda led a fun game time to break the ice. It was great to see all the students participating and smiling. 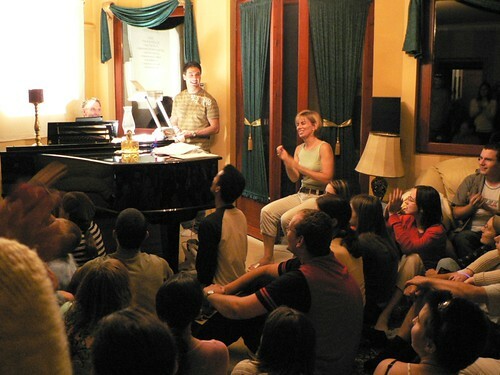 Afterwards, Miki led us in singing a worship song in English (which the students really enjoy). We closed the night with our first English Bible study. I first showed a clip from the Passion, where Jesus Christ was on trial. 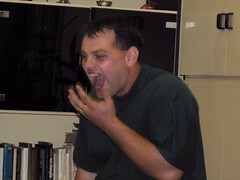 I then told the students that we will put Jesus on trial. Through the 9 weeks that we meet together, as jurors we will seek to hear from Jesus his own testimony about Himself. As jurors, we should not come with prejudices, or stereotypes forming our views, but rather hear first hand His claims. Afterwards, I encouraged them to make a decision of rejecting or believing in response to Jesus Christ's testimony about Himself. I look forward to these 9 weeks and how God will reveal Himself through His Son and through the word. This part of class is offered for free, and is therefore not a requirement. Please pray that many would stay for this second hour and continue to hear the testimony of Jesus Christ and gain a clear understanding of what He taught about Himself. 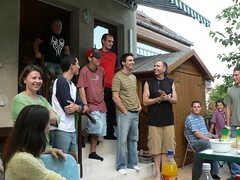 Above: Gabi S., Dávid and new student Szandi. 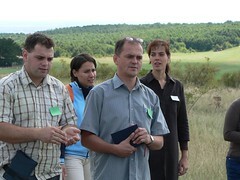 Above: On Saturday, Miki and I had fellowship with churchplanters from Gyöngyös and a village close to Eger. Leaders from the Baptist's mission in Hungary facilitated our time as we discussed ways in which we could strengthen each other's work by unifying our efforts. It was a fruitful time which we hope will lead to a greater interconnectedness in churchplanting in Heves County (our focus area). 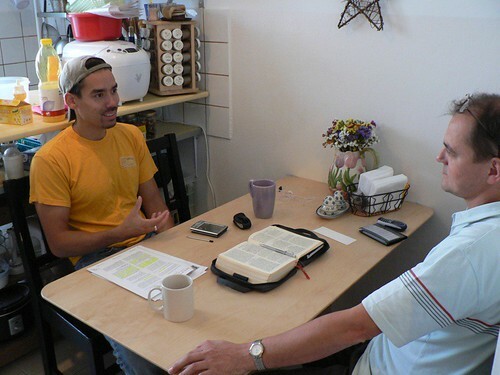 Above: On Sunday morning, I met with DezsÅ‘ for discipleship. This is one of the most enjoyable times for me as I hear how God is moving in DezsÅ‘'s heart. 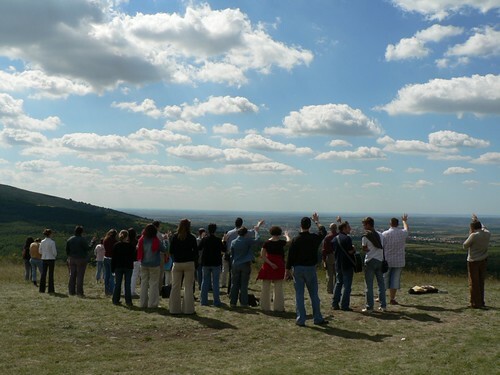 We spent time discussing the calling and motivations of a leader in God's kingdom. I have recently been impressed by how DezsÅ‘ handled a conflict in a relationship with another member. After discussing the Biblical principles for conflict resolution and Christian love, DezsÅ‘ applied what he learned against his own cultural inclinations to 'just let it be.' This resulted in a continued peace and unity in the body and a lesson learned living out his faith. Please continue to pray for DezsÅ‘ and his wife Marcsi as they grow in their faith and find their calling in building up the Body. Above: On Sunday afternoon, we had our first 'Csaladi Nap' (Family Day). Some of you may remember that we often held Kid's Days with a hope to draw entire families, however, only children attended. Upon re-evaluating this ministry, we decided to rename it 'Family Day' and focus on inviting those families we already know personally through our VBS and Pre-school. Above: We were thankful to see new guests such as Tamara (Above R), and regular visitors such as Andi attend with their children. After Julika dramatically retold the story of Joseph from the Bible to the whole group, we split into small groups for further discussion. We discussed the possible reasons why so many families are falling apart. We discussed the current influence of media and culture on the family. And finally we discussed the solution–Jesus Christ. We praise God for a successful first 'Family Day' and hope that our church will someday be filled with families transformed by His grace and leadership. You can see all the Family Day pictures here. Tomorrow is SHARON'S BIRTHDAY!!!! Unfortunately, half the family is sick (Elianna, Kira and myself). Please pray for our healing, and that Sharon would have a great day of course! Tomorrow night we kick-off a new semester of ESL classes in PetÅ‘fibánya. Please pray for us as we will spend the second course hour in conversations leading to the gospel. Above: After 3 weeks of wigglage (that's my own word), Ben loses his first babytooth, otherwise known in hungarian as 'tejfog' (literal translation: milk tooth). This brings back memories of my multicultural upbringing. My mother (Chinese) had no familiarity with the infamous tooth fairy. 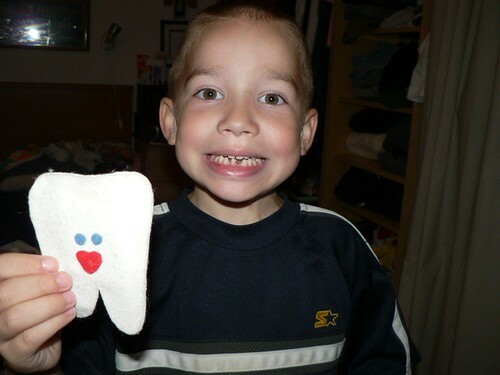 So, when I lost my first tooth and placed it under my pillow there was no profit to be found the next morning. When my mother found me sobbing, I explained my twisted expectations to her. She responded by educating my 5 year old mind of the cultural tradition in Taiwan of throwing lost teeth at the nearest wall. In the end, I didn't get any money. But I did learn about a new culture! So now you may ask, what did you tell Ben to do with his tooth. I will leave that for your imagination. Above: Our Wednesday night worship practice. With the addition of Sharon on the flute, the music just keeps getting better! Sharon is not sure if she will play right away, but she has begun to practice with us with the hope of playing in the near future (she did a great job at practice). 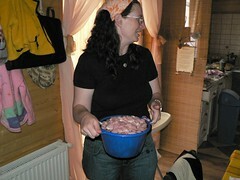 Above L: Sharon transporting the mystery meat (a combination of deer, goat and pork). 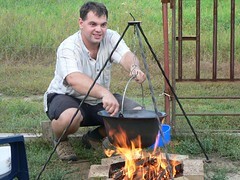 Above R: With no concern for OSHA regulations, Miki preps the boiling kettle for Thursday night's cook out. We joined our two groups (teenager and adult) together for a time of fellowship. Above: Expressive Elianna filling Heidi in on her day at pre-school. 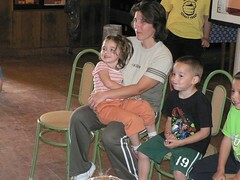 Above: Janka and Ildiko with Kira. 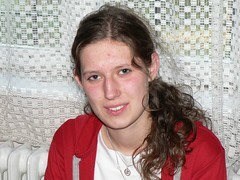 Ildiko (teenager Zoli's mother) recently made a profession of faith in Jesus Christ. We were encouraged to hear her thoughts in the Bible study which revealed a new trust in God as opposed to her previous trust in herself. Above: While the stew simmers, we began our Bible study on a proper view of ourselves in Christ. Above: O.K., so the stew took a bit longer to cook than we thought. 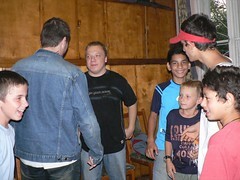 Zoli (above R jean jacket) tried to use his position as Ildiko's son to get served first, but she denied his scheming. By 7:00, our bellies were more than ready to receive Miki's mystery meat stew. It was excellent! 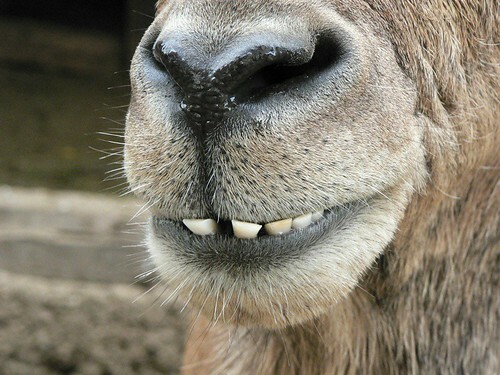 Above: I couldn't resist taking a picture of this animal's smile. Saturday, our focus group team took a road trip to team member Csaba's hometown of Veszprém. We toured the city on foot, had a great lunch together and ended the day at the zoo. 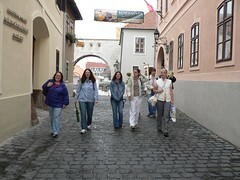 This was a great way of spending some 'free' time together as we are usually in the midst of intense ministry. Above L: Sharon checking out the view of Veszprém from the castle. 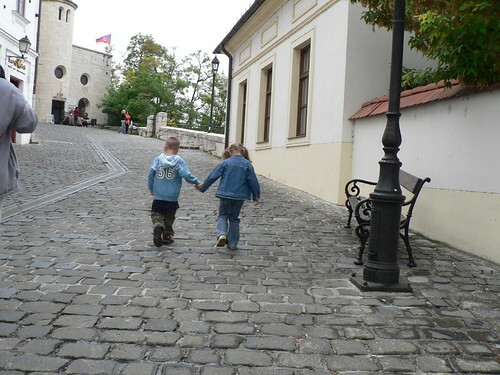 Above R: Ben and Anna (Miki's daughter) are close friends and spent the majority of the day holding hands as they enjoyed the sights. 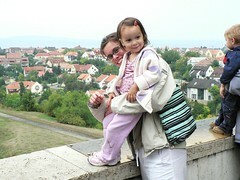 Above L: Janka securing Elianna so that she can see over the castle wall. Above R: A refreshing day where we had time to take time with each other. We praise God for blessing us with perfect weather for ejoying the entire day outside. 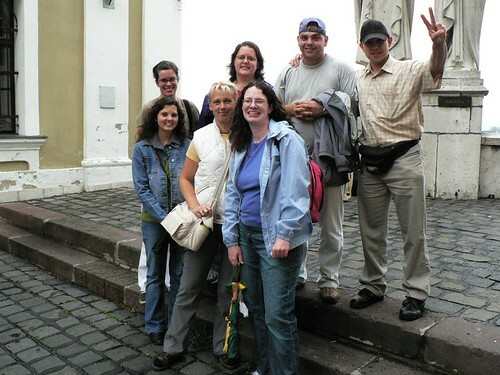 Above: Our multinational churchplanting team. 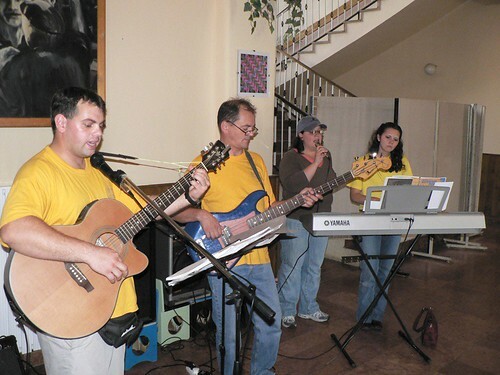 Top row L to R: Janka, Brenda, Miki and Csaba. Bottom row L to R: Heidi, Erika and Sharon. Holding the camera: Me. If you would like to see more photos from our trip of our kids, our team, Vesprém or even more strange pictures of animals, click here. Above: Sharon, Kira and Andi. Andi has been coming to Miki's Thursday night Bible studies, and is a regular visitor to church. I was thankful that she brought her two children tonight, one of which is friends with Ben in preschool. Our prayer is that entire families will come to know Jesus. DezsÅ‘'s family is an answer to that prayer and we are hoping Andi's will be as well. Above: Teammate Heidi sharing about what God has been teaching her recently. She had been convicted that she had drifted from a heart attitude of total surrender to Jesus and spoke about a turning back to Him as Lord. Coincidentally (yeah right), the message I had prepared for this tonight spoke about the exact same thing, using a verse that she read in her testimony. God sovereignly led this evening to communicate His desire that we completely trust Him by completely following Him in all areas of our lives. Above: My 'boys' Zoli and Gabi. I pray that the Lord would use me in their lives to bring them to a strong and living faith in Jesus. For the first time (I think), I don't have any pictures with this post (sorry). In any case, it has been a full week as we prepare ourselves for upcoming ministry events. Starting on the 25th (Sharon's birthday), we will resume our ESL community classes with an exciting change in format. Last year, we split our time into two 45 minute sessions using a English workbook as our guide. This year, we will be using the first 45 minutes for book/classwork and the second 45 minutes for small group conversation on topics from the Bible. We hope that this new change in format will allow for more opportunity to understand where people stand spiritually and also to share the gospel. 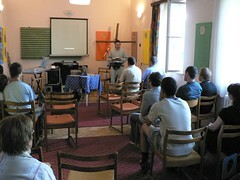 In preparation for these classes, we ordered Bibles from the Bible league in Budapest. As the Bibles were being transported, the truck toppled over. Thank the Lord, the driver was not injured, and we can always get more Bibles:) Guess who doesn't want these people to get their hands on the living Word? On Thursday, I spent some time with Zoli and Dávid for our weekly discipleship meeting. It is always a blessing to pray together with these guys and see them in the process of a growing faith. 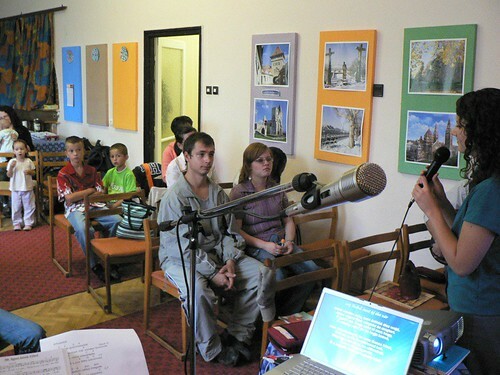 Dávid continues to have opportunity at school to defend his faith among those who are involved in the occult. Please pray for him to have wisdom and strength as he seeks to share the hope that he has in Christ. Zoli, Dávid, Gabi and myself are looking forward to a new opportunity to serve in an orphanage/home for kids with behavioral problems in the neighboring town of Selyp. We hope to be able to visit this home once a month and spend time with these troubled kids. This is a great opportunity for us to bring God's love to a group of people that have been in many ways completely rejected in society. 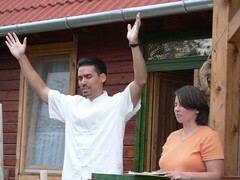 Our Hungarian partners in ministry, Miki and Erika have been praying about work for some time now. God answered in an amazing way! 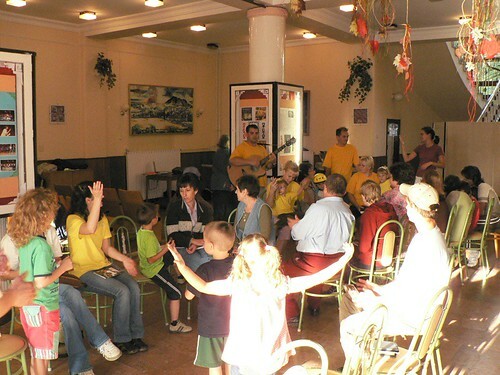 The public middle school of PetÅ‘fibánya 'out of the blue' called Erika and offered her a job working with children with learning disabilities. This is exactly the type of work that Erika prepared for in college. Instead of jumping at the opportunity, Miki and Erika began praying, to know for sure if this was God's will. They decided if the woman calls back from the school and asks again, they will take further steps. A few days later, the woman called back, but Erika was busy with one of her kids and couldn't answer the phone. She thought, "If it really is God's will, she will call back." And she called back again. After working out the details, Erika took the job, and we rejoice as a team that God has placed a light in this school through Erika. This school has a terrible reputation, and from what I have witnessed doing puppet ministry in this middle school-it was definitely one of the worst schools. A few days after Erika accepted the job, the news got even better. A woman from Selyp who served with us in our recent VBS will also be taking this job part time. Her name is Anita and she is also a Christian. The light just got brighter! Praise God for his sovereign work to provide at just the right time and in just the right place. Please pray for Erika and Anita that God would use them to display His glory and draw many to Himself through their Christian lives. Above: On Saturday, DezsÅ‘, Miki, Csaba, Heidi and myself traveled to Gyöngyös (25 minute car ride) to participate in a time of organized prayer. 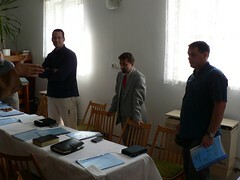 It was an encouraging time, as visitors from various towns also shared testimony about how God was at work among them. One woman told the story of her desire to reach out to a friend at work. She invited this friend to an outreach event which could only occur if the weather held out. Her friend agreed to go. On the day of the outreach, the rain began pouring. Her friend at work, said, "Oh, this weather is terrible. I just wish it would stop raining." Then she told her friend, "What time would you like it to stop raining?" Her friend said, "Well, 4:00 pm would be nice." Leaving her friend, she prayed to God with a smile and said, "You heard our conversation." Later in the day, they began talking again at work and noticed that the pouring rain suddenly cleared. The sun became brilliant. They both looked at the clock. 4:00pm. This opened up a great opportunity for her to give testimony about Jesus Christ. Above L: Marcsi and Betti. 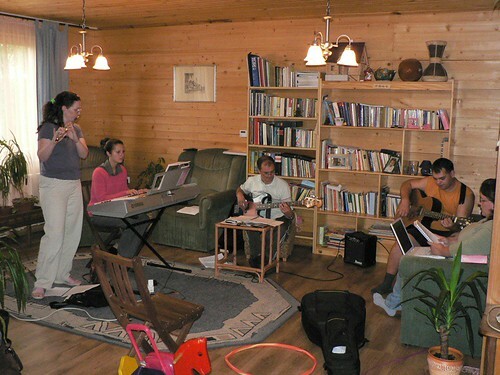 Above R: After our time together in Gyöngyös, we were invited in for some fresh baked treats by DezsÅ‘'s wife Marcsi. 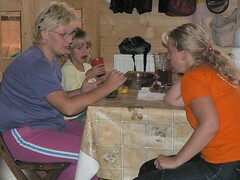 The woman seated above with dark hair is DezsÅ‘'s mother, Irénke. She recently had mastectomy due to cancer and was thankful for a full recovery. We were able to pray for her together as she is now concerned about a new pain in her side that may be related. Please pray that she may be completely healed. Above L: Csaba starting a new series of 5 minute messages on prayer. Above R: Janka's sister in law came to visit our church tonight and shared testimony of God healing her from a dangerous sickness. 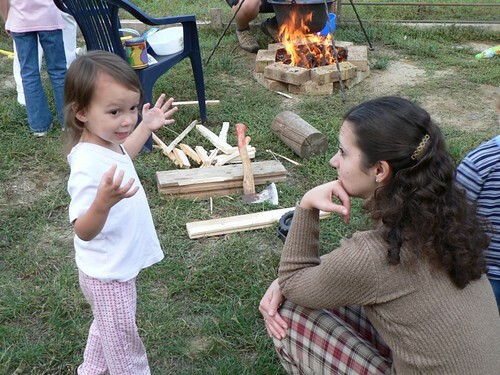 Above: Elianna having fun with Miki's son Bence. 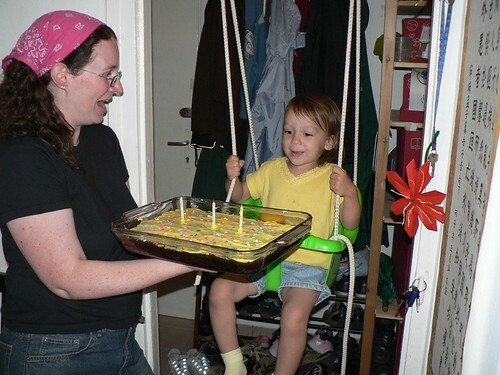 Above: Our 3 year old Birthday girl being surprised by mom with a special homemade chocolate cake. Happy Birthday Elianna! 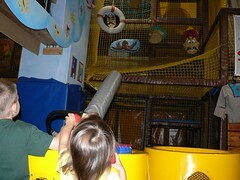 Elianna celebrated her birthday at a indoor park in Budapest. 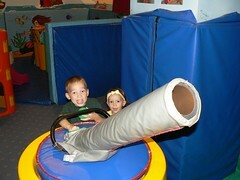 Above: Elianna helping Ben load up the air cannon with balls to shoot the pirates. Above: Look ma, no hands! Kira enjoying watching Ben and Elianna play. 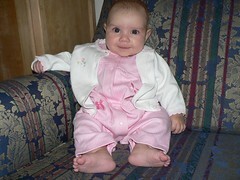 Above: Elianna is now old enough to attend pre-school and started on Wednesday. 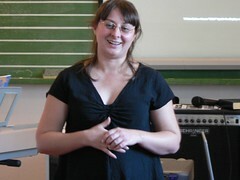 Edina, who is one of Elianna's teachers (pictured above) has attended our english classes and Bible studies in the past. Please pray that she would be continually drawn to Jesus and find new life in Him. 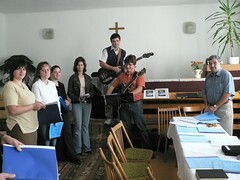 On Wednesday night, we met for worship practice. It was evident that there has been a change in Marcsi's heart. 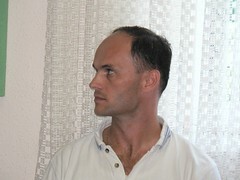 DezsÅ‘ shared the DVD of his baptism with many of his family members, and said, "everyone was moved". DezsÅ‘ said that in the past, while at home, he always sensed a barrier while praying. He told us that after his baptism, this barrier was lifted. For the first time, he truly senses Christ's presence while praying and sometimes loses the time while in prayer. On Thursdays, Miki and I hold separate studies. I meet with the teens, while Miki and Erika continue to lead a Bible study with those we have met over the years through our English program and other contacts. I was proud of Gabi and Zoli who were able to recite the verse we committed to memorize last week. While we were going over our 'homework' Zoli, told me that his mother helped him with one of the questions. 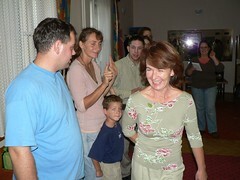 Zoli's mother Ildiko attends Miki's small group. Ildiko brought great news on thursday night-she has put her faith in Jesus Christ! 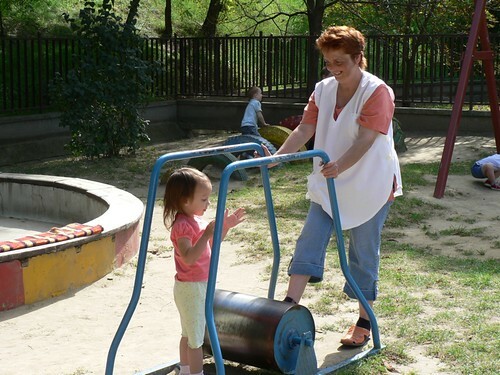 We have seen a steady softening of Ildiko's heart as she has attended Miki's small group. It is ironic that she was not saved in the group, but God sent someone to her at work last week who shared the gospel (someone who has no connection to our church). 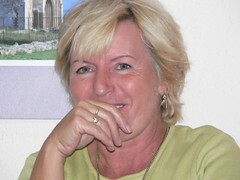 Praise God for his love for Ildiko and His masterplan to save her. 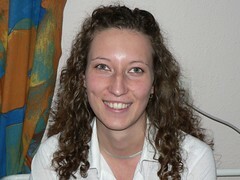 Please pray for Ildiko who comes from a cultic background. Pray that she may gain a full understanding of God's love in Jesus Christ, and that she may come to know what it means to live as a member of His body. Above: Today (Friday), we met with the teens to play soccer. We had a great time, and I realized something. My body is deteriorating :) That's right, I'm getting old. While aggressively attempting to intercept a pass, I extended my leg in such a way that my calve muscle cramped. Umm, this has never happened to me in my 'younger years'. As I writhed in pain, on my back all of the teens gathered around. Sensing that this looked like I was in labor I blurted out, "is it a boy or a girl??!" Above L: Check out Miki's sweat! Because of his great love, it comes in the form of a heart on his chest :) Above R: My precious Kira. Tomorrow, some of our team is heading out to Gyöngyös where another church planter has organized a time of focused prayer. Above: Yesterday (Saturday), I loaded up the Mercer ministry mobile with 5 teens from PetÅ‘fibánya and traveled into Budapest for a English Camp reunion party. 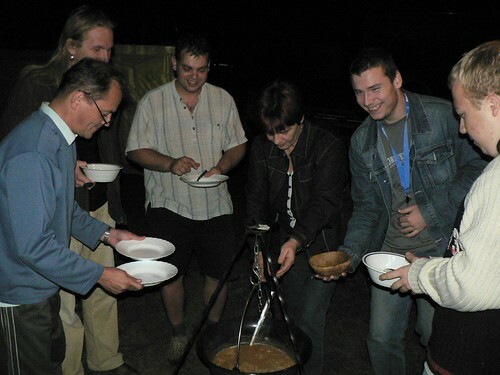 These parties are designed to help us keep in touch with the campers who are from many different parts of Hungary. We had a great time catching up with each other and of course playing games in small groups. We hope that many of these teens will continue seeking truth. Todd, the leader of a Pioneers focus group team in Budapest, will be offering students an opportunity to meet weekly for Bible study. Please pray for the continued follow up as we desire that all campers gain a clear understanding of the gospel and respond with faith in Jesus Christ. 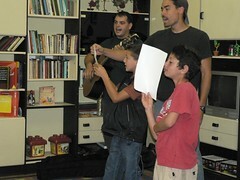 Above: Pioneers teammate Andris leading his group in collaboratively written song. 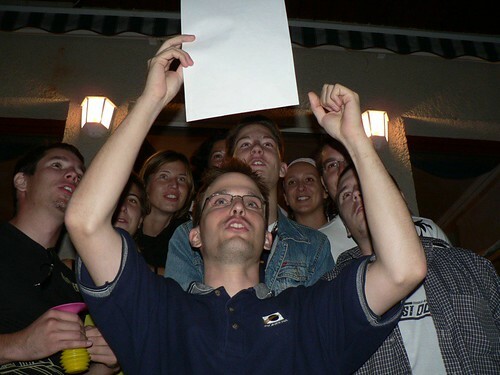 Above: Pioneers teammate Todd leading us in worship songs at the English party. Above: Miki greeting Andi. Andi works in our local pre-school and is a regular visitor of our church. Above R: Sharon and Val. 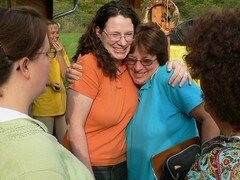 Val (one of our Pioneers team leaders) will be leaving for furlough soon. Please pray for her time in the US to be encouraging and refreshing. 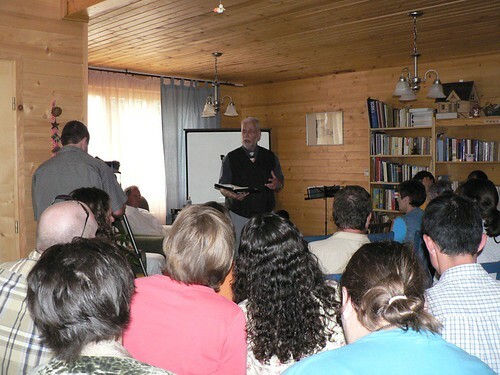 Above: György Kovács brought an encouraging message of how God is pleased with His Son and pleased with all those who become His children through faith in Jesus Christ. Above: Tonight we celebrated the Baptism of DezsÅ‘ and Márcsi at Miki's house. Márcsi and DezsÅ‘ blessed us with their testimonies. It is such a privilege to witness the fruit of God's work in saving sinners by His grace! 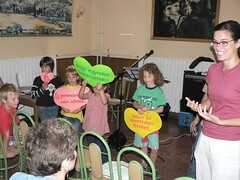 Above L: Singing a song of praise for God's provision of forgiveness and new life. Above R: Giving thanks to God for the gift of HIs Son, and His grace in making us one in Christ. Above: Celebrating Elianna's 'big 3' birthday at church. 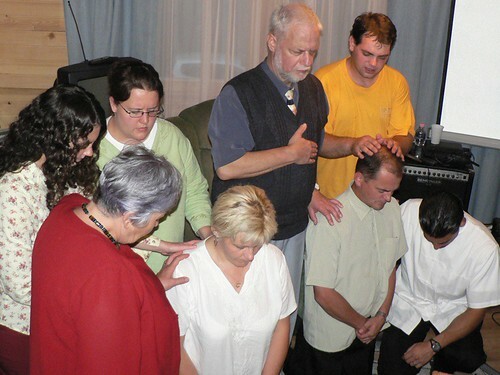 Above: Committing our new family into God's hands through prayer. 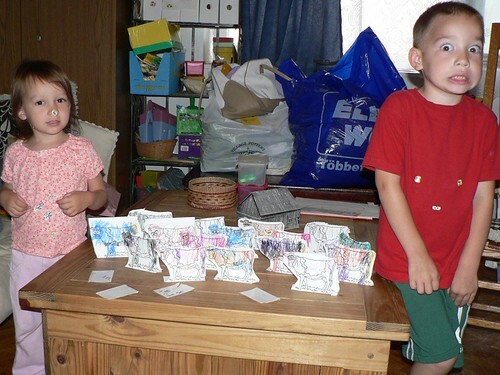 Above: Elianna and Ben struck with mad cow craft disease. 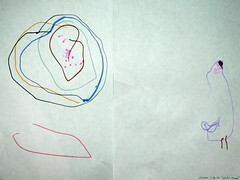 Above L: Elianna with her colorful rendition of "swirlies" and a "seal chicken". 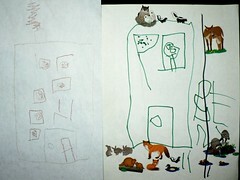 Above R: Ben with his interpretation of our apartment (the funny guy in the window is me of course). I would wish for so much wildlife in our midst, but to this day I haven't seen one squirrel on our property. 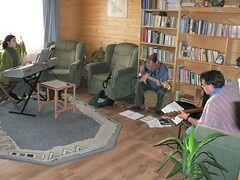 Above L: Heidi, DezsÅ‘ and Miki at our Wednesday night worship practice. Above R: This is a good time for Erika to connect with Márcsi (DezsÅ‘'s wife) and spend some time in the word. 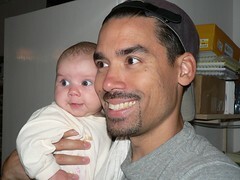 Márcsi and DezsÅ‘ will be baptized this Sunday! 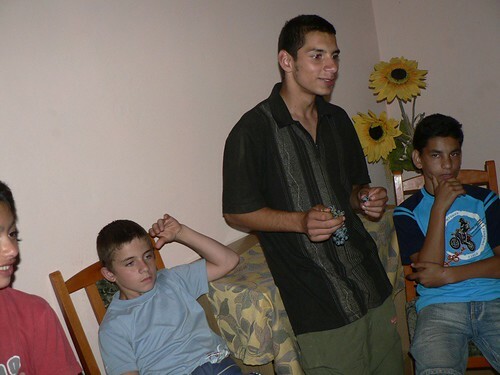 Above: The Three Stooges, or the three students, Dávid, Gabi (sitting) and Zoli. Thursday night, was encouraging as I met with them for our weekly discipleship group. We talked about how the Bible should be the filter through which we pour all experience through. We talked about the importance of God's word having authority in our lives and our responsibility in responding (against natural inclinations) to God's perfect guidance. I had them pause and consider these words that are also given to all who follow Jesus. He will turn us into fishers of people. I had them consider their unique role as possibly the only ones called by God in their class to share the gospel. Each of them started school on Friday. It may be that they are the only ones (they all go to different schools) who are equipped to share the hope they have found in Jesus Christ in their class. As this truth settled in their hearts, I particularly saw Dávid's face light up in awe. Please pray that these young men would be sensitive to the Holy Spirit and find joy in being fishers of men in their classes. This morning (Friday) we had our weekly team meeting where we discussed an exciting new outreach that we plan to do at the end of September. As a follow up to our VBS, we will be personally inviting families to a "Family Day" where we will play games together, crafts, sing and share the gospel. Please pray for us as we continue to plan the details. After the meeting, Miki and I (Allen) were off to a neighboring village where our teammate's Suzuki broke down. Actually, something went wrong with her built in alarm system which disables the engine. I was able to tow her car to a local man who specializes in electrical car problems. Thankfully, for under ten bucks, he was able to fix the problem. Praise God! Back on the road, Miki and I set out to find a baptismal solution. Our last baptism was done in his bathtub, with teenagers Zoli and Dávid. This Sunday, Márcsi and DezsÅ‘ will be baptized. We first searched for an inflatable pool, but it seems the season has already passed, and all stores were out of stock. What did we end up buying? A wine vat. So many people make their own wine here that we found a large plastic wine vat which is perfect for one person to be baptized. We can also use this vat in multiple places (fits in my truck). And, the symbolism is also fitting! This vat is used to store the grapes until they mature. We pray that DezsÅ‘ and Márcsi will also continually grow in maturity as they follow their Lord and Savior Jesus Christ. Tomorrow, I am taking the teens to a "Grill Party" for the campers who attended our ESL camp this summer. Please pray for more opportunity to share the gospel, and to connect with the teens who will attend.